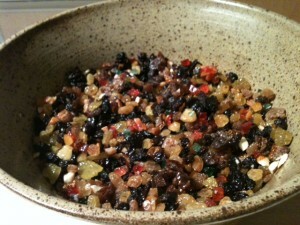 Yesterday, I was just cutting up the dried fruit for my Christmas cake, which always takes me back home to Townsville of course. 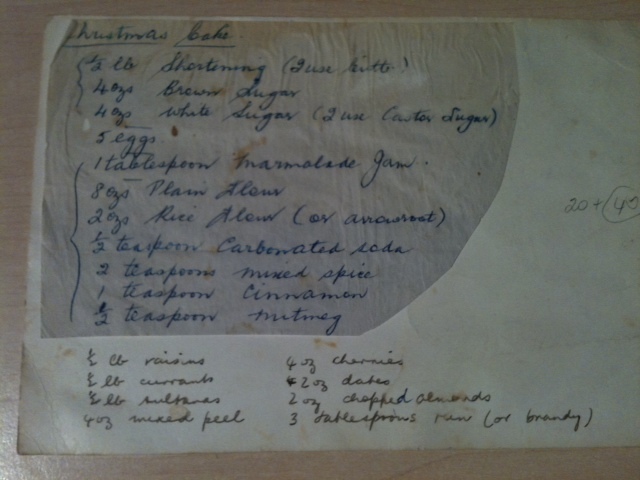 I’m using my mother’s recipe, that she got from her mother, written in Mum’s lovely copperplate writing (she used to handwrite wills in a solicitor’s office when she was young) and still on the onion paper she used to send me airmail letters when I first came to France, so I’m feeling very traditional. 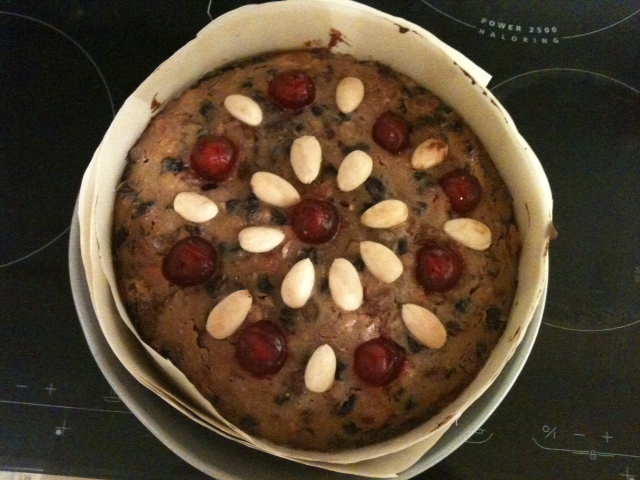 Our Christmas cake was a whole ritual. Mum very rarely made cakes so it always seemed very special. First, she would get out the big scales with their special weights to make sure all the ingredients were the exact weight. Then we’d cut up everything up into small pieces; the rum was added and it was left overnight. Next day, we would get to sift the flour and mixed spice together with the special sifter, and get it all over everything. 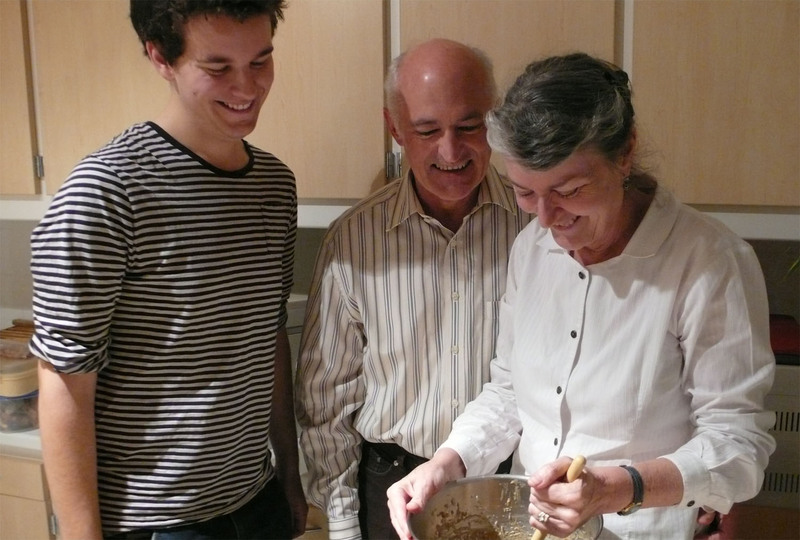 For years after I began making the cake in France, I used to mix the spices myself, guessing what proportions I should use, but when Black Cat came home from UQ, she brought me two boxes. Mum would do the creaming of the butter and sugar. After that, I’d vie with my sister to see who would crack the eggs. Since there were five eggs and she was the oldest, I’d only get to break two. I usually got to put the dollop of marmelade in though. Then the flour was added alternately with the mixed fruit until it got harder and harder to stir. Then would come the big moment when everyone had to come and stir the cake and have a wish. We did that today. We’re two children short this year – Leonardo’s in Australia and Forge Ahead’s in Madagascar – but we have Brainy Pianist to give us a helping hand. I don’t know if this is a custom in other Australian families, but I suspect it was really devised by some clever ancestor to give the poor cook some relief from stirring the thick mixture by herself! 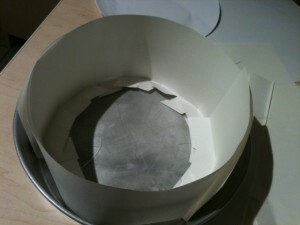 After that, you have to cut the paper for the cake tin: two layers of brown paper and one layer of butcher’s paper. Since I don’t have either, I just use extra large sheets of thick white paper. You have to cut circles for the bottom and top and long strips for the sides. You butter the sides of the tin then line them with the paper. After you’ve spooned the mixture in, you add a decoration of blanched almonds and candied cherries. Then it’s time to lick the bowl! Do I dare admit that I still like doing that today? You then cook it for 3 hours and try not to go to bed and forget the cake’s still in the oven. When it’s ready, you wrap the cake and the tin in a thick tea towel and leave it until Christmas. It will then keep for several months if it doesn’t get finished off immediately. Chop fruit. Place in basin. Add spirits and stand at least overnight. Line cake tin (8 inch diameter) with 2 layers of brown paper and one of white. Also sides of tin (have paper come up to 3 inches (7 cm) above tin). Also 2 brown and one white paper circles for top of cake. Cream shortening & sugar. Add whole eggs one at a time, beating well. Add marmelade, then siften dry ingredients alternately with prepared fruit. Stir evenly. Bake in an electric oven at 900°F (150°C) for about 3 hours. Bake slowly. Remove. Wrap tin (with cake in it) in old cloth. Let cool in tin. This entry was posted in Australian customs, Food and tagged Christmas cake, copperplate writing. Bookmark the permalink. Sounds lovely! I still have fond memories of licking the bowl when my granny used to make Christmas cake (we called it black cake in Trinidad). Of course, it was more like three cups of rum in her recipe – and this, after soaking the fruits in rum for a month! Maybe I should add a little extra for good measure! Some habits never die no matter how old you are. I made 8 dozen cupcakes recently for a family event and got to lick the bowl – and the beaters – twice. Of course I did wash everything between the 2 batches! By licking the bowl we mean using a soft spatula to scrape out the residue from around the bowl and not letting same residue go to waste. Beaters are done with fingers. It’s also a good way of telling (allbeit too late) whether you have left anything out of the recipe. Ah, now I’ll remember next time that by licking the bowl, I can tell if anything is left out of the recipe! Eight dozen cupcakes is a lot of cooking.